WASHINGTON - September 17 - Senator Russell Feingold (D-WI) today introduced legislation that would narrow several provisions of the Patriot Act and other surveillance laws, including the FISA Amendments Act of 2008 (FAA). Three sections of the Patriot Act - the John Doe roving wiretap provision, Section 215 or the "library records" provision and the "lone wolf" provision - are up for renewal this year and will expire on December 31 if Congress does not take action. The American Civil Liberties Union has endorsed the new bill, the JUSTICE Act, and calls on Congress to move quickly to pass it. "Over the past eight years, Congress and the executive branch have allowed for more and more surveillance while doing little to protect Americans' privacy rights," said Michael Macleod-Ball, Acting Director of the ACLU Washington Legislative Office. "The JUSTICE Act is a much needed remedy for the overbroad and out of control surveillance in our country. Given that three of the Patriot Act's provisions expire at the end of the year, it's vital that Congress pass the JUSTICE Act as quickly as it can so that proper action can be taken to protect Americans' privacy rights." The JUSTICE Act would make vital changes to the Patriot Act and the FISA Amendments Act by inserting privacy and civil liberties safeguards into each law. The JUSTICE Act would amend the National Security Letter (NSL) provision of the Patriot Act by establishing a standard of individualized suspicion, mandating meaningful judicial review and requiring thorough reporting on the FBI's use of NSLs to Congress. The NSL provision of the Patriot Act greatly expanded the FBI's ability to secretly demand sensitive and private customer records from Internet Service Providers, financial institutions and credit bureaus without prior judicial approval and to impose gag orders on record demand recipients. The ACLU has successfully challenged the constitutionality of the amended NSL statute's gag provisions in a lawsuit called Doe v. Holder. A lower court ruled in 2007 that NSL gag provisions were unconstitutional and in December 2008 the U.S. Court of Appeals for the Second Circuit upheld that ruling in part, agreeing that the NSL statute's gag provision violated the First Amendment. The JUSTICE Act would restrict the sweeping wiretapping powers given to the government in the FISA Amendments Act passed last year, preventing agencies from conducting bulk collection of Americans' communications. The Act would also repeal a highly controversial provision in the FAA that granted immunity to telephone companies that aided the Bush administration in its illegal and unconstitutional warrantless wiretapping program. "This bill will give our surveillance laws the overhaul they so desperately need, restraining the government from unconstitutionally collecting vast amounts of data about innocent Americans," said Michelle Richardson, ACLU Legislative Counsel. "Ensuring public reporting is a crucial part of keeping our government's surveillance powers in check. Holding law enforcement accountable for how it uses these tools will not only help to preserve Americans' privacy, it will ultimately keep us safer. Congress must make passing the JUSTICE Act a priority." BTC- What an awkward circle of celebration this is. Picture government officials gathered around a fold out table with little cupcakes to celebrate the retardation of an achievement which actually disserves and angers the majority of New Yorkers. It reminds me of a scene from Office Space. Most New Yorkers oppose the Enhanced Drivers Licenses. Legalizing EDLs in NY was perceived as one of former Governor Spitzer's failures. The EDL is equipped with a Radio Frequency Identification (RFID) tag containing a unique number with no personal information. The number can be read only by specialized equipment at select border crossing locations. On November 24, 2008, the first RFID Vicinity reader lanes opened in Buffalo. Buffalo was the first city in New York to add the RFID lanes and only the third area in the nation. Three additional New York ports of entry, including Champlain, Massena and Alexandria Bay had this equipment installed in April 2009. The entire network in the U.S. was installed by the end of May 2009, encompassing the 39 busiest land border crossings in the nation. Over the course of the summer, everyone's life has been touched by an embittering battle over our nations prospects for healthcare. Political reform is never easy. Many have attempted to recruit my judgements about the healthcare debate. We have sensitively and accurately stayed far from the healthcare debate so as not to impugn the Real ID debate with the political entrapments of this issue. Trusted friends in the media, Republican & Democrat have gone out of their way to get our validation with no success of extracting comment. That was until today, when Reuter's published this piece of bait, to lure us out from the safety of hiding by invoking the efficacy of the 10th Amendment. The decline and fall of the Real ID Act is considered a landmark success for those who needed the 10th Amendment to repudiate a run on privacy and identity. States assertion of personal boundaries to the federal government provided relief to frightened citizens facing the overwhelming compromises Real ID regulations would demand on them. 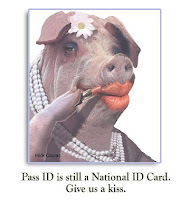 Real ID regulations are insidiously dangerous to citizens. No matter how fast and vigorously Rep. James Sensenbrenner jumps up and down waving his copy of the 9-11 Commission Report recommendations; it won't stop a cloning hacker or greedy marketing aggregates from skimming an EDL card containing intimate information about us, unless we stop ourselves from getting the card. Sensenbrenner won't be there to pick up the pieces of your life after it happens either. Let's focus on a breakthrough for humanity where health coverage does not cost persons their rights, their life or life savings. If the focus of national health does not discourage prosperity, you may achieve the historical landmark for healthcare. We point to the wisdom of the founding fathers and guidance of the 4th Amendment as an arc of light to create the tamper-proof clarity for our concerns. You shouldn't have to choose between the Constitution and healthcare. They aren't mutually exclusive. The U.S. Justice Department issued a letter Tuesday asking Congress to renew provisions of the law that allow authorities to conduct roving electronic eavesdropping, or wiretaps, access business records and track so-called "lone wolf" suspects with no known links to foreign powers or terrorist groups. Some lawmakers and civil libertarians have criticized the provisions, saying they infringe on Americans' right to privacy. The Justice Department says the administration is willing to consider stronger privacy protections as long as they do not "undermine the effectiveness" of the provisions. UK ID cards to be abolished? He’s right in many ways. Contracts have been signed. Money has been committed and legal costs could be very high if the government tries to wiggle out of those contracts now. As David Lyon’s new book on ID makes it very clear, ID cards schemes are a global industry with powerful corporate forces involved. In any case, the real reason the scheme should be scrapped or significantly reduced in ambition, is because it is based on flawed premises and is massively intrusive and controlling. The fact that it also costs a ridiculous amount of money (and will of course, escalate in costs still further, as every state computer project inevitably does), is simply a contingent factor. BTC - We spoke with Boston Globe city reporter Stephen Smith yesterday to update information about current innoculation programs. The story to follow was published 11/28/08 - last year. The information, after checking with the Boston Public Health Commission's, Ann Scales, is still current and factually sound. We are now in the process of requesting a photo from EMS of current inocculation bracelets given to those accepting voluntary swine flu shots. According to Scales, they do not have an RFID tag in them. We spoke this afternoon to Jennifer Mehigan of Boston EMS to find out more about H1N1 and the existence of permanent innoculation bracelets given to those who come for vaccines. The picture is the actual immunization record given to those who voluntarily receive the flu shot. As you can plainly see, it is not a metal "shackle" containing an RFID tag and is not required or even implied by local law to be a permanent fixture for the patient. She mentioned that a bracelet containing an RFID tag had been up for consideration for low fatality outbreaks. The local government decided on a barcode system of data management to track a patient after they have been vaccinated. The current system is being used during flu seasons to test it's effectiveness to track lethal pandemic outbreaks declared as federal emergencies. According to Mehigan, the H1N1 virus or swine flu does not currently possess the threat level necessary to require FEMA's assistance in identifying vaccine recipients. FEMA has more direct understanding of federal bracelet systems and disaster readiness programs in those cases. "Simply put, when we say “patient tracking,” what we really mean is vaccination tracking. When a resident gets a flu vaccine through BPHC, they will receive a barcode number on a sticker either attached to a bracelet or a vaccination card. The barcode tracks where the vaccine has gone and tracks the patient through the number and not their name," says Mehigan of Boston EMS Communications. The State of Massachusetts attracted national news attention recently over legislation which has passed at least one chamber to require citizens to take the H1N1 vaccine or be fined up to $1000 a day until providing proof of inocculation. The State legislation has since drawn intense criticism since that time. When people arrive for their shots, they will get an ID bracelet with a barcode. Next, basic information - name, age, gender, address - will be entered into the patient tracking database. There will be electronic records, too, of who gave the vaccine and whether it was injected into the right arm or the left, and time-stamped for that day. (BOSTON)--Using technology originally developed for mass disasters, Boston disease trackers are embarking on a novel experiment - one of the first in the country - aimed at eventually creating a citywide registry of everyone who has had a flu vaccination. The resulting vaccination map would allow swift intervention in neighborhoods left vulnerable to the fast-moving respiratory illness. The trial starts this afternoon, when several hundred people are expected to queue up for immunizations at the headquarters of the Boston Public Health Commission. Each of them will get a bracelet printed with a unique identifier code. Information about the vaccine's recipients, and the shot, will be entered into handheld devices similar to those used by delivery truck drivers. Boston is believed to be the first city to embrace this particular approach to tracking vaccinations against the seasonal flu, estimated to kill 36,000 people each year in the United States, principally the elderly. But acknowledging patients' privacy concerns, officials promised that if a citywide system were implemented, only a limited amount of information would be gathered - all sitting behind an encrypted firewall. "I have had people say, 'Oh, that's so big brother,' " said Laura Williams, EMS deputy chief of staff. "But in truth, the unique identifier is unique to the incident. It's not like you will go to the hospital, and they'll say, 'You're the one who got the flu vaccine at 10 o'clock yesterday at the Boston Public Health Commission.' "
The Corbett Report featured this Australian anti-chipping activist Greg Nikkolettos, of We The People Will Not Be Chipped. A key witness in a federal probe into passport information stolen from the State Department was fatally shot in front of a District church, the Metropolitan Police Department said. A State Department spokeswoman declined to comment, saying the investigation into the passport fraud is ongoing. "If you are not a member of the Seneca Nation of Indians, fear not. The Saint Regis Indians, the Oneida Indian Nation of New York and the Haudenosaune (otherwise known as Onondaga, et al) are right in line (as well as every other federally recognized tribe). And guess what? You get to have your "Nation's" logo on the card (maybe even your Indian name). No one will ever know you finally declared your subjugation to your oppressors. Hell, you won't even have to show the card. It will transmit who and what you are from your pocket. So let's hear it for those defenders of Sovereignty and Native rights. " BTC -Part of my unfortunate burden here at BTC is to sift through alarmist shock hubris and find out where the law actually has presence. Laws can be ligitimately challenged, afterall. 9/17/09 UPDATE -EMS shows current innoculation bracelet tags. We spoke with Officer Evansen this afternoon. He would not release the State or the name of the hospital which possessed the rumored RFID embedded innoculation bracelets; which have been called "shackles" by some. He had not actually seen one of these bracelets himself or even a picture of the bracelets. However, he did mention that the Boston Globe had done some coverage of the the H1N1 mandates for public health in Massachussetts. We are still waiting to hear back from Gideon Gil of the Boston globe about any news on the subject. We also spoke with the Massachusetts Dept. of Public Health's, Immunization surveillance program. The task of Immunization Surveillance is to watch for outbreak trends. The unidentified woman who took our call about "innoculation bracelets" associated with identifying those who had received a vaccination. At the time of the call this afternoon, they had never heard of innoculation bracelets. We also asked her when, if at any time, their agency might not be in charge of immunization administration in the event of a federal disaster. She did not know and was baffled by the question. The woman refused to divulge her name, explaining that she was not to speak with the press. We intend to bring you more information about the existence, legal precedents and grounds for the purchase and use of RFID embedded innoculation bracelets. The talk of mandatory vaccinations is based on the Model State Emergency Health Powers Act (MSEHPA), passed December of 2001. MSEHPA intends to protect individual rights and civil liberty, UNLESS you have been found to be a carrier or in the path of a deadly outbreak of swine flu virus in any one of these states: AL, AK, AZ, CA, CT, DE, FL, GA, HI, ID, IL, IN, IA, LA, ME, MD, MN, MO, MT, NV, NH, NJ, NM, NC, OK, OR, PA, RI, SC, SD, TN, TX, UT, VT, VA, WI, and WY. Thanks to Freedom's Phoenix and PPJ author Barbara Peterson, we have spectacularly alarming information about vaccination mandates, martial law and a way to cuff you with a permanent tracking identity bracelet. Populace control bracelets were invented to monitor those under house arrest. Over time variations of this invention were adapted and tested for national security purposes. Since 9-11, the market to track and control the movements of the average American has expanded to include things like TSA bracelets for casual travellers and airline employees. Bracelet systems were used on displaced people in transit to and from hurricanes Ike and Katrina. Now, of course, knowing who you are in the event of a national disaster has becomes paramount to personal sovereignty because it makes some disaster profiteers rich and empowers shadow government officials escalation. I would like to point to the example of the State of Massachussetts; which has passed a bill through the Senate to fine their citizens up to $1,000/day for refusing a vaccine in the event of a pandemic flu outbreak. A word of caution, disasters may be precipitated or even contrived for the gain of political power. In times, of federal or even international disaster a different government entirely steps up to assume control. As long as there is a consistent state of emergency a certain group of unelected officials assume power due to policies revolving around Continuity of Government. As I have indicated in previous blogs, the H1N1 pandemic is an example of one such contrived and aggressively promoted disaster. You are not encouraged to take the vaccine due to the known toxic amounts of mercury and many other problematic toxins and potentially fatal agents found in some of the vaccines. For anyone facing a fine, unemployment or imprisonment due to an H1N1 vaccine, we want to help you . 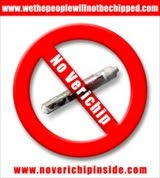 Please ask us for forms to give to your doctor, employer and lawyer by e-mailing : beatthechip@gmail.com with VACCINE FORM in the subject line. New Mexico and other states objecting to provisions of the federal Real ID Act hope a new version will have security guidelines that are easier to meet, at costs they can afford. For now, though, New Mexico is among states that by Oct. 11 will seek an extension to comply with rules governing one of the most commonly used forms of government-issued identification: driver's licenses. If federal officials don't grant an extension, state Department of Taxation and Revenue Secretary Rick Homans said, "you have to be compliant by January 2010 or they will not accept residents' driver's licenses from those states for airline travel." Passengers could still use alternative forms of government-issued identification for boarding a plane, such as a passport. Thirty-three states oppose the plan, something Homans called "basically a state rebellion." "I just can't see a way Real ID will be implemented because so many states have taken such a strong stand and won't be bullied by the federal government on this," Homans said last week. "I think Real ID is basically DOA." One of the main sticking points in New Mexico's case is that the state issues driver's licenses to foreign nationals. The Real ID Act, passed in 2005 as part of a broader effort to tighten security following the Sept. 11, 2001, terrorist attacks, requires proof of legal status in the country to get a driver's license. Homans said U.S. Department of Homeland Security officials recently visited the state to look at New Mexico's procedures for issuing those licenses, including steps the Motor Vehicle Division takes to verify documents. Since 2003, New Mexico has allowed immigrants to get driver's licenses using a Mexican government-issued ID or a taxpayer identification number. The state, which has issued thousands of such licenses, recently stepped up document verification and works with Mexican officials to check authenticity. Gov. Bill Richardson and others say roads are safer because immigrants learn about driving under U.S. laws. Others point out that immigrants with licenses are required to have proof of insurance, which has lowered the state's uninsured driver rate. Opponents have said the system is easy to foil, allowing noncitizens to get a government ID under false pretenses. Like the Real ID Act, a new proposal known as the PASS ID Act contains a provision requiring proof of lawful status to get an approved ID. Richardson "has reservations about both proposals and he does not plan on changing his position," a spokesman said. That means state officials will wait and see what, if anything, changes as the PASS ID Act develops, and what New Mexico will have to do to be compliant. The new proposal's title is shorthand for Providing Additional Security in States' Identification Act of 2009. A Senate committee has approved the bill, which would have to clear the full Senate and House. 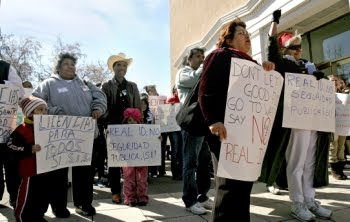 Like New Mexico, other states that object to Real ID have complained about costs and privacy issues, among other things. And New Mexico privacy advocates say the PASS ID Act isn't much different from the first try at a national ID law. 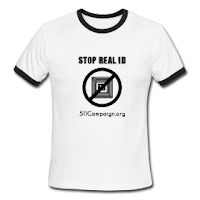 "It really does most everything Real ID did," said Peter Simonson, executive director of the ACLU-New Mexico. "It did nothing to stem the concern of privacy rights organizations that states wouldn't incorporate radio-frequencies chips in the cards, so ultimately you'd have a situation where people's data could be scanned from afar, that other data could be stored there, that people could illegally scan the data," he said. Simonson said he's also concerned about other things included in the proposal, including giant databases of information that could be vulnerable to hacking. The PASS ID Act also contains a provision that requires state laws to include provisions that employees who handle the documents a driver presents must complete training on fraudulent document recognition. It also would help states with some of the upfront costs of complying with the mandates, unlike the Real ID, which Homans said would cost the state $12 million to implement, including equipment and software, and $1.5 million in recurring annual costs. Totals costs to states would reach at least $11 billion over five years, according to a report by the National Conference of State Legislatures, the National Governors Association and the American Association of Motor Vehicle Administrators. A spokesman for the Air Transport Association in Washington, D.C., said the group doesn't prefer one act over the other. "We don't have a preference from a security perspective. We rely on the Department of Homeland Security and the (Transportation Security Administration) to make the decisions that are in the best interest of the country," said David Castelveter, vice president of communications. He added: "We certainly do, in fact, want whatever those decisions are, as it relates to transportation, to be as seamless as possible to the passenger." Contact Kate Nash at 986-3036 or knash@sfnewmexican.com. Read her blog at www.greenchilechatter.com. In 2006, The Washington Post reported..."Suspicion of wrongdoing ran so deep that the 10-member commission, in a secret meeting at the end of its tenure in summer 2004, debated referring the matter to the Justice Department for criminal investigation, according to several commission sources. Staff members and some commissioners thought that e-mails and other evidence provided enough probable cause to believe that military and aviation officials violated the law by making false statements to Congress and to the commission..."
Farmer, Dean of Rutger Universities' School of Law and former Attorney General of New Jersey, was responsible for drafting the original flawed 9/11 report. The 9/11 Commission head, Thomas Kean, was the Republican governor of New Jersey. He had the following to say... “We to this day don’t know why NORAD [the North American Aerospace Command] told us what they told us, it was just so far from the truth. . . " When Bush's own handpicked commission failed to go along with the cover up and requested a criminal investigation, why was nothing done? 9/11 Commission member and former US Senator, Bob Kerrey, says, "No one is more qualified to write the definitive book about the tragedy of 9/11 than John Farmer. Fortunately, he has done so. Even more fortunately the language is clear, alive and instructive for anyone who wants to make certain this never happens again." With the only "official" 9/11 report now totally false, where do we go from here? Who is hurt by these lies? The families of the victims of 9/11 have fought, for years, to get to the truth. For years, our government has hidden behind lies and secrecy to deny them closure. What does Farmer's book tell us? Farmer offers no solutions, only a total and full rejection of what was told and his own his own ideas concerning the total failure of honesty on the part of the government, a government with something to hide. Farmer never tells us what. Nobody could keep a job in the public sector speaking out more than Farmer has. What were Farmer's omissions? There are some. Now that we know that intelligence given the 9/11 Commission wasn't just lies from our own government but based on testimony coerced through torture from informants forced to back up a cover story now proven false, a pattern emerges. We know that, immediately after 9/11, many more potential suspects and informants were flown directly to Saudi Arabia by Presidential order than were ever detained and questioned. We will never know what they could have said. Their testimony would have been vital to any real investigation were they not put beyond the reach of even Congress and the FBI. Putting aside all other questions of recent evidence of CIA involvement with bin Laden prior to 9/11 or altered physical evidence involving the Pentagon attack, any failure to call to account the systematic perjury committed by dozens of top government officials, now exposed as a certainty is an offense to every American. What do we know? We know the conjecture about 9/11 still stands but for certain, we know we were lied to, not in a minor way, but systematically as part of a plot covering up government involvement at nearly every level, perhaps gross negligence, perhaps something with darker intent. Are we willing to live with another lie to go with the Warren Report, Iran Contra and so many others? Has the sacrifice of thousands more Americans, killed, wounded or irreparably damaged by a war knowingly built on the same lies from the same liars who misled the 9/11 Commission pushed us beyond willingness to confront the truth? Have we yet found where the lies have begun and ended? There is no evidence of this, only evidence to the contrary. The lies live on and the truth will never be sought. The courage for that task has not been found. Can anyone call themselves an American if they don't demand, even with the last drop of their blood, that the truth be found? How long have we watered the Tree of Deceit with the blood of patriots?